‘More than perhaps any other theologian in the twentieth century, Karl Barth has dominated the subject-matter of theology and posed the questions with which the theologians of the different churches have been, and are, occupied, although they may want to “go beyond” him, go back behind him, or even protest against his answers’ (Eberhard Busch). Karl Barth’s theological legacy provides both opportunity and challenge for historic, confessional evangelicalism. 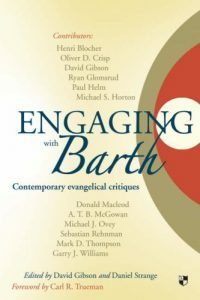 While there are now numerous excellent studies highlighting the value of Barth’s theology, often receiving it with ringing endorsement, there are fewer more cautionary or critical responses. This volume engages critically and courteously with Barth on a range of vital topics where, for the contributors, his interpretation of Scripture, reading of church history, and confession of Christian doctrine are unsatisfactory. This engagement is offered as a positive contribution to the wider programme of constructive theological reflection that seeks to articulate the gospel of Jesus Christ in and for the contemporary world, in the conviction that the ‘pattern of sound teaching’ (2 Timothy 1:13) really matters.